Emancipation Day or Independence Day, commemorates the abolition of serfdom in Tonga by King George Tupou in 1862, and the independence of Tonga from the British protectorate in 1970. Tonga (Tongan: Pule?anga Fakatu?i ?o Tonga), officially the Kingdom of Tonga, is a Polynesian sovereign state and archipelago comprising 176 islands with a surface area of about 750 km2 (290 sq mi) scattered over 700,000 km2 (270,000 sq mi) of the southern Pacific Ocean, of which 52 are inhabited by its 103,000 people. Tonga stretches over about 800 km (500 mi) in a north-south line about a third of the distance from New Zealand to Hawaii. It is surrounded by Fiji and Wallis and Futuna (France) to the northwest, Samoa to the northeast, Niue to the east, Kermadec (part of New Zealand) to the southwest, and New Caledonia (France) and Vanuatu to the west. Tonga became known as the Friendly Islands because of the congenial reception accorded to Captain James Cook on his first visit in 1773. He arrived at the time of the ?inasi festival, the yearly donation of the first fruits to the Tu?i Tonga (the islands’ paramount chief) and so received an invitation to the festivities. According to the writer William Mariner, the chiefs wanted to kill Cook during the gathering but could not agree on a plan. 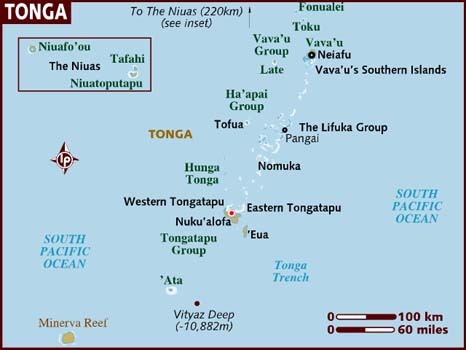 The dates of the initial settlement of Tonga are still subject to debate, nonetheless one of the oldest occupied sites is found in the village of Pea on Tongatapu. Based on radiocarbon dating of a shell found at the site dates the occupation at 3180 ± 100 BP. 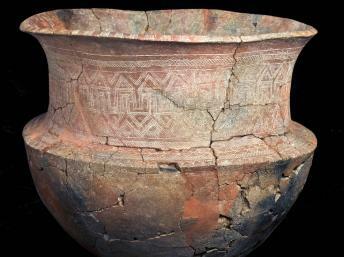 Some of the oldest sites pertaining to the first occupants of the Tongan Islands are found on Tongatapu which is also where the first Lapita ceramics were found by WC McKern in 1921. Reaching the Tongan islands was a remarkable feat accomplished by the Lapita peoples. Not much is known about Tonga before European contact because of the lack of a writing system. There are, however, transcripts of oral histories told to the early European explorers. 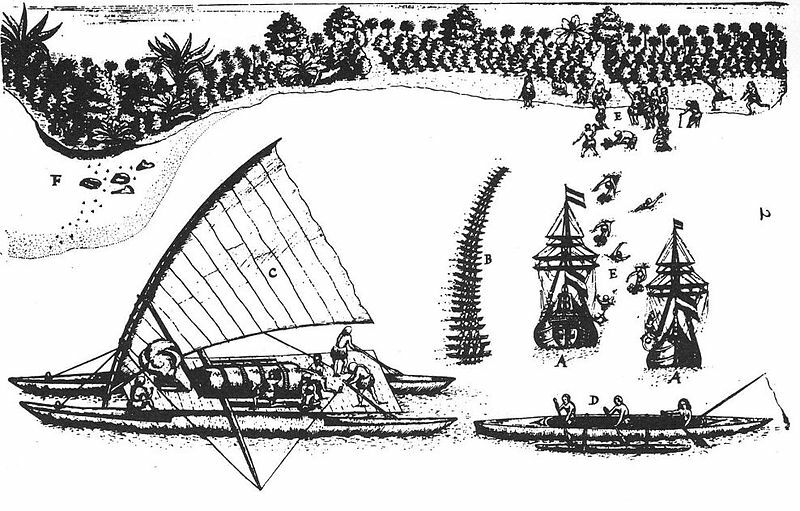 The first time the Tongan people encountered Europeans was in April 1616 when Jacob Le Maire and Willem Schouten made a short visit to the islands to trade. Centuries before Westerners arrived, Tongans created large monumental stoneworks, most notably, the Ha?amonga ?a Maui and the Langi (terraced tombs). 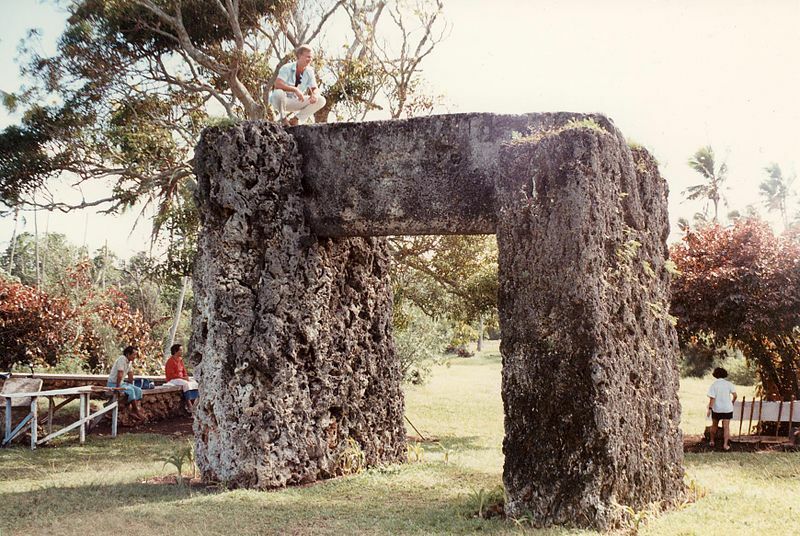 The Ha?amonga is 5 meters high and made of three coral-lime stones that weigh more than 40 tons each. The Langi are low, very flat, two or three tier pyramids that mark the graves of former kings. By the 12th century, Tongans, and the Tongan kings, the Tu’i Tonga, were known across the Pacific, from Niu?, Samoa to Tikopia they ruled these nations for over 400 years, sparking some historians to refer to a “Tongan Empire,” although it was more of a network of interacting navigators, chiefs, and adventurers. It is unclear whether chiefs of the other islands actually came to Tonga regularly to acknowledge their sovereign. Distinctive pottery and Tapa cloth designs also show that the Tongans have traveled from the far reaches of Micronesia, all the way to Fiji and even Hawaii. In the 15th century and again in the 17th, civil war erupted. Into this situation the first European explorers arrived, beginning in 1616 with the Dutch explorers Willem Schouten and Jacob Le Maire (who called on the northern island of Niuatoputapu), and in 1643 with Abel Tasman (who visited Tongatapu and Ha?apai). Later noteworthy European visitors included James Cook (British Navy) in 1773, 1774, and 1777, Alessandro Malaspina (Spanish Navy) in 1793, the first London missionaries in 1797, and the Wesleyan Methodist Rev. Walter Lawry in 1822. In 1845 the ambitious young warrior, strategist, and orator T?ufa? ?hau united Tonga into a kingdom. He held the chiefly title of Tu?i Kanokupolu, but had been baptized with the name Siaosi (“George”) in 1831. 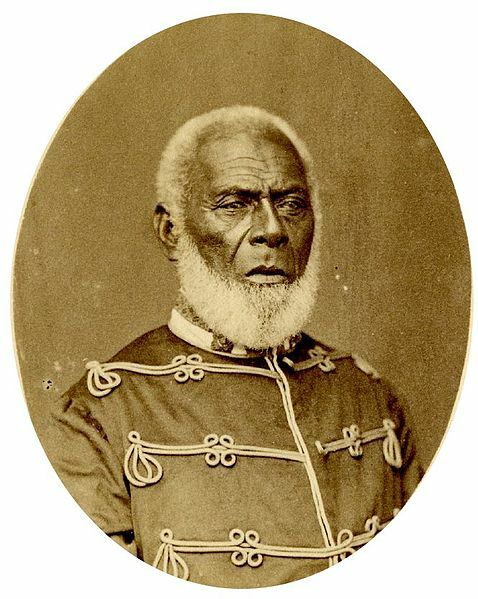 In 1875, with the help of missionary Shirley Waldemar Baker, he declared Tonga a constitutional monarchy; formally adopted the western royal style; emancipated the “serfs,” enshrined a code of law, land tenure, and freedom of the press; and limited the power of the chiefs. Tonga became a protected state under a Treaty of Friendship with Britain on 18 May 1900, when European settlers and rival Tongan chiefs tried to oust the second king. The treaty posted no higher permanent representative on Tonga than a British Consul (1901–1970). Although under the protection of Britain, Tonga maintained its sovereignty, and remained the only Pacific nation never to have given up its monarchical government (as did Tahiti and Hawai?i). The Tongan monarchy follows an uninterrupted succession of hereditary rulers from one family. The Treaty of Friendship and Tonga’s protection status ended in 1970 under arrangements established by Queen Salote Tupou III prior to her death in 1965. Tonga joined the Commonwealth of Nations in 1970 (atypically as an autochthonous monarchy, with its own local monarch rather than that of the United Kingdom—compare Malaysia, Lesotho, and Swaziland), and became a member of the United Nations in September 1999. While exposed to colonial pressures, Tonga has never lost indigenous governance, which makes it unique in the Pacific. In former times, there was only one main meal, a midday meal cooked in an earth oven. Villagers would rise, eat some leftover food from the previous day’s meal, and set out to work in the fields, fishing, gathering shellfish, etc. The results of the morning’s work would be cooked by the men, and served to the assembled household. The remnants would be placed in a basket suspended from a tree. This food is served as an end-of-the-day snack as well as the next day’s breakfast. Food past its prime was given to the pigs. The diet consisted mainly of taro, yams, bananas, coconuts, and fish baked in leaves; shellfish were usually served raw, as a relish. The liquid from the center of coconuts was commonly drunk, and the soft “spoon meat” of young coconuts much relished. Baked breadfruit was eaten in season. Pigs were killed and cooked only on special occasions, such as weddings, funerals, feasts honoring a visiting chief, and the like. Tongans also ate chickens. Food could be stored by feeding it to pigs. Pre-contact Tongans also built elevated storehouses for yams. Yams would keep only a few months. 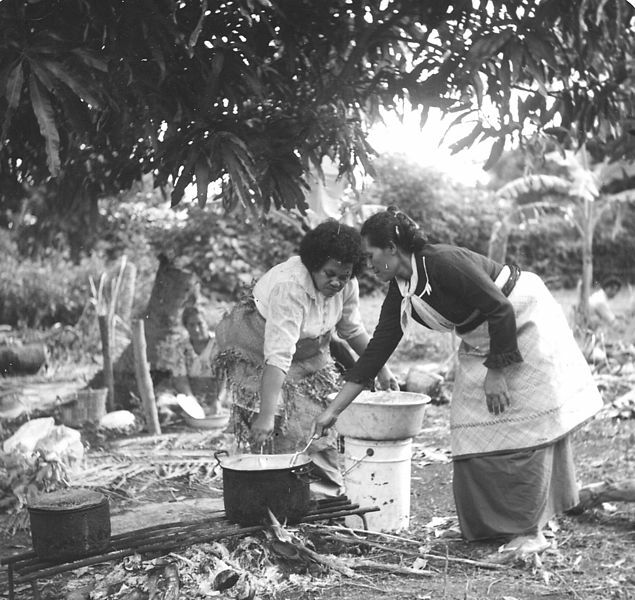 Hence a household’s main security was generous distribution of food to relatives and neighbors, who were thus put under an obligation to share in their turn – typical of traditional Polynesian cultures. 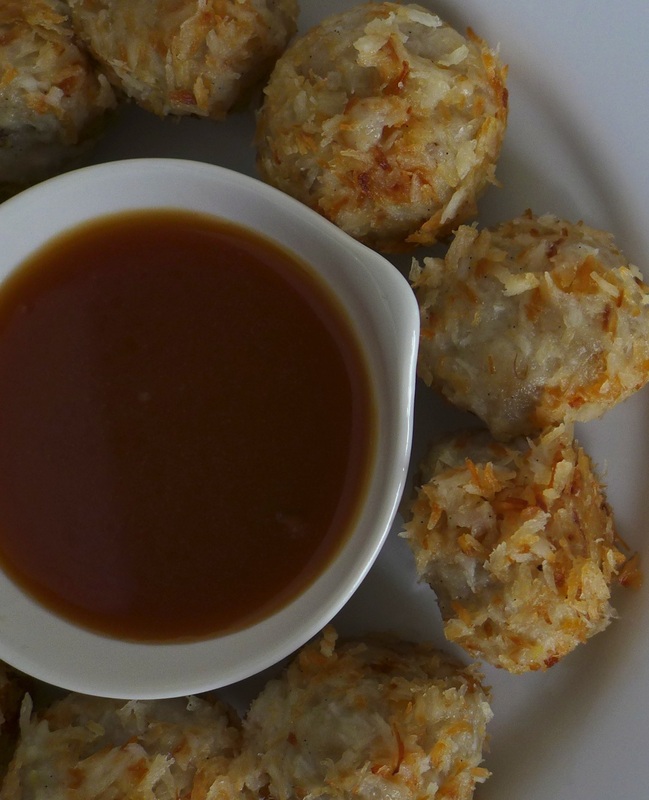 Topai (flour dumplings) in sweet coconut syrup are extremely popular on Tonga and very easy to make. The ones here are plain but you can add all manner of ingredients to enrich them; for example, breadfruit or mei (faikakai mei) a combination of taro leaves and flour (faikakai ngou’a), a combination of flour and ripe bananas (faikakai malimali), or manioke which is tapioca or casava (faikakai manioke tama). You can get raw sugar in health food stores. It is not the same as brown sugar, but brown sugar will work. Put the sugar in a heavy saucepan and melt over gentle heat. Before the sugar boils, add the coconut cream and stir continuously until thick. Keep warm. Boil the water in a large pot. Sift the flour and baking powder together. Make a dough that just holds together by adding water slowly and mixing with your hands. Drop tablespoonfuls of the dough into the boiling water and gently boil for a further 10 minutes or until cooked. Place the dumplings in a bowl and pour the syrup over them.